How can blogging help students reflect and connect? 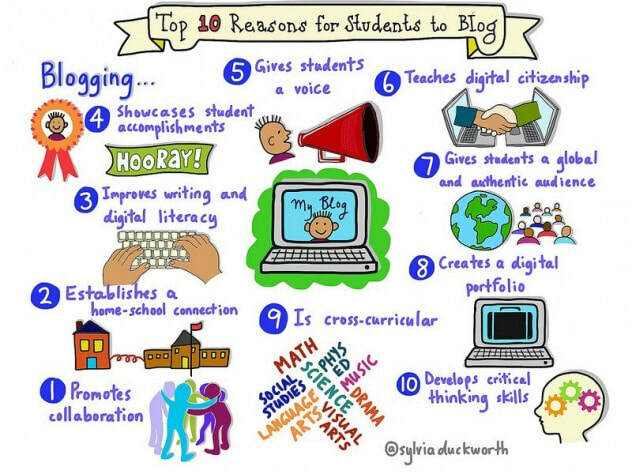 ​Blogging allows students to reflect on both their experiences and their learning. Blogging gives students a voice and the opportunity to create global connections. As educators we can support this process and help to develop students that will be successful in the 21st Century. As our children are growing up in an age where technology is growing at a rapid rate and we are preparing them for jobs that do not currently exist, we must change our classrooms to prepare them for this ever changing world. We must create classrooms that allow for both rigorous academics and the development of 21st century skills. New Technology High School has been doing project based learning (PBL) for over twenty years; the site is transitioning to an interdisciplinary model of PBL. Based on previous research, New Technology High School created a system for blog portfolios as a graduation requirement; therefore, all students have the platform to create and share blog posts. Informal student feedback led to the question about how we can incorporate blog portfolios into the classroom rather than be something extra. Math scores in the state, district, and site are very low. District math test results on the 2017 CAASPP show that over 65% of students were below standard. It became clear that we need to create space and support for students to learn math not in isolation but integrated with other content areas while also supporting 21st century skills. Blogging allows students to document both their process and learning, it allows them to collaborate and network, as well as teach and learn from others. This is a way for students in a Project Based world to develop 21st century skills. Here is a short video introduction to some reasons why blogging will support students in an ever evolving world. The focus of the research is to look at the question, how can blogging in an interdisciplinary project supports the development of 21st century skills and content knowledge, specifically math content? This study looks at one use of technology that supports the development of 21st century skills; the 6 C’s, Communication, Collaboration, Critical Thinking, Creativity, Character, and global Citizenship, and how it can support content as we push our practice and stretch our thinking of high quality PBL. In the first round of research my driving question was, how does using blogging within an interdisciplinary project affect mathematics content achievement? By looking at quantitative and qualitative data I found that blogging about math does not necessarily increase their math scores; however their blog score had a strong positive correlation to their final assessment scores. This led me to think about how blogging can be used not only as a way to reflect and connect, but also as a great tool for formative assessment, and feedback. After analyzing the results of the round one research and getting feedback from other stakeholders, in the second round of research I decided to look at how we can make blogging more valuable to students. I found that blogging would be more valuable to students if there was an expert or other stakeholder that read their blog and gave them feedback.